The latest in a line of great posts digging into the processes, technologies and tools behind deploying Stack Overflow (the programmers’ Q+A site). A guide explaining HTTP/2 from the basics up - this could be a handy high level resource to share with others within your organization. An interesting attempt at providing a learning experience for picking up OAuth2 via playing a classic text adventure game, Zork. 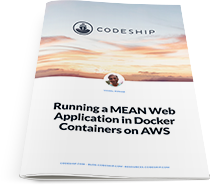 This free Codeship eBook will teach you how to install and run a web application on the MEAN stack and how to host this app in Docker containers on AWS. A collection of essays and articles brought together by key members of Google’s Site Reliability Team. An unconventional use of AWS Lambda and HAProxy to scale down infrastructure requirements on the fly without affecting existing users. An introduction to a paper analyzing what happens when you ‘docker run’ a container image and a look at ‘Slacker’, a Docker storage driver optimized for fast startup. “Rails 5 will be the easiest release ever to get running on Heroku,” says Richard Schneeman, before showing off how it’ll take just five lines at the command prompt. But how does it work? An interesting look at how a major train ticket company in the UK uses dashboards and metrics to improve customer experience. Football Addicts, creators of Forza Football, are looking for Ruby developers who are dedicated to building great mobile apps for football fans all over the world. Come join our small team in Gothenburg, Sweden. A hosted log management service that lets you aggregate, tail, search, and react to log messages in a jiffy. Enjoy Papertrail’s free plan - no credit card required.